De Dutch is a pannenkoeken house, the only one in Alberta of a BC chain. It’s open for breakfast and lunch until 3 pm, and on Pancake Day (Tuesday February 12th) it’s staying open until 8 pm. My friend who’s lived in the Netherlands tells me that people there eat pannenkoeken at suppertime, but that the food at De Dutch is otherwise authentic enough to keep going back. Pannenkoeken are frying-pan-sized thin pancakes with interesting toppings or batter additions – a bit like crêpes but not rolled or folded up. 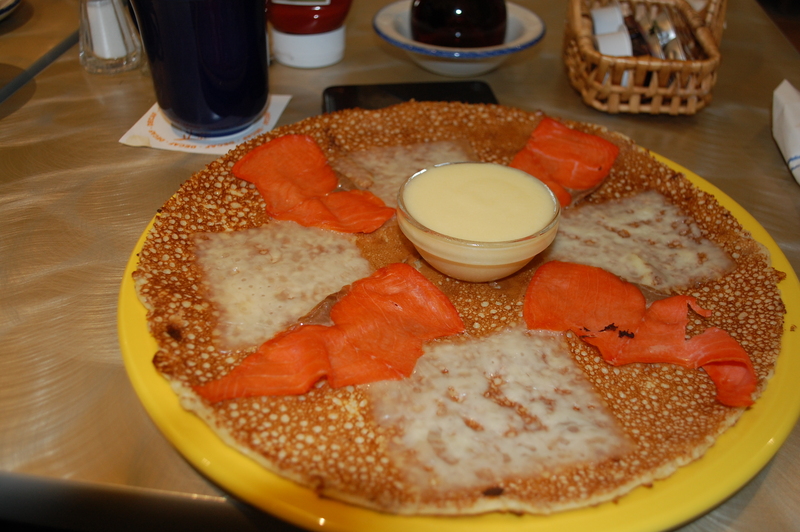 I had the “Windmill”, with Edam cheese, smoked salmon, and a little dish of Hollandaise sauce to pour over it. It was delicious, and fresh so that the pannenkoek wasn’t soggy at all, although it was a little thicker than a Breton crêpe. And after I looked at it, I realised that the name “Windmill” was probably from the shape of the toppings. Duh. Some of my friends had versions with meat, with ham and eggs, or with sweet fruit toppings. Others had tosties, which looked like interesting grilled sandwiches. One of my lunch companions said it was the best sandwich he has ever had, but to be fair I should mention that he isn’t quite four. 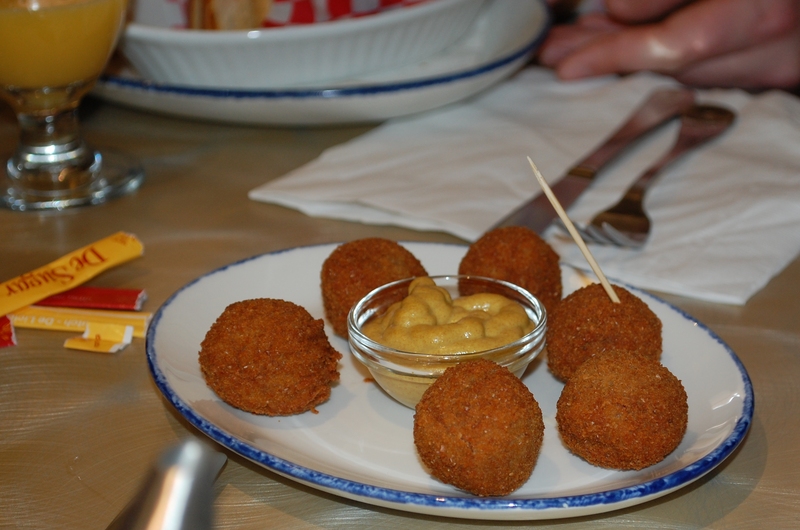 We also shared an order of bitterballen (singular, bitterbal) which my friend told us are a common bar snack in the Netherlands, little crunchy-breaded deepfried bites with meat-paste inside them, eaten with mustard. They were okay as an accompaniment to lunch, but they would be great along with beer. My bill was a little over $20 including fresh coffee with refills. De Dutch is at 10030 Jasper Avenue. That’s in the block with construction, but it’s easy to get to on foot from either end of the block, or from the Central LRT station. It’s open every day, weekdays from 7 am. This entry was posted in Food, Uncategorized and tagged de dutch, food, restaurant on January 27, 2013 by Ephemeral Pleasures. Makes sense! So you could post that you were eating pannenkoeken and your Dutch friends might be eating them simultaneously! Thanks for the spelling correction. When I lived in BC, I recall seeing franchise advertisements for the De Dutch and the early closing time (compared to other restaurants) was one of their most prominent selling points to potential franchisees. Having your evenings free in the restaurant business is a rare perk!